Inspired by the potential of origami—commonly known as paper folding—Worcester Polytechnic Institute (WPI) professor Cagdas Onal is developing robotic technology that could one day rescue people from disaster areas or make everyday tasks easier for people with physical challenges. Onal, assistant professor of mechanical engineering, recently received a five-year, $500,000 CAREER award from the National Science Foundation (NSF) to research a new approach to engineering variable-stiffness soft robots that are shaped like snakes and have the ability to carry heavy loads. The CAREER Award is the NSF’s most prestigious honor for young scholar-educators. Onal is one of eight WPI faculty members who have received CAREER awards since 2015. Onal has been building robots with soft, gel-like materials for several years, using pneumatic actuation to transmit power. But the unique properties of soft robots—their ability to bend on many axes and change their shape—make them unable to carry heavy loads. More recently, Onal and his research team have been studying research on origami design, which use thin sheets of relatively stiff materials that are made bendable along designated fold lines. “We realized if we combined these two design approaches, we might be able to create soft, continuous octopus-like arms that have stiffness in some directions and softness in others, in a way that is not possible with just a soft material,” said Onal, whose research team has a provisional patent on the origami design. The result is an accordion-like plastic structure called a “module”—with alternating hexagonal and triangular panels. About three inches in height, each module has the proper balance of softness and rigidity to move as it carries heavy loads. “It needs to be rigid enough to carry weight but soft enough to conform,” he added. The self-contained modules, which each have actuators and wiring for communications and control, can be connected to form a variety of shapes. “So instead of a rigid arm, for example, we can build an arm that is continuously deformable, which means you can now get into tight quarters,” he said. As a result, an origami robotic arm could perform tasks that rigid arms cannot, such as inspecting fragile items, or, fitted with a video unit, squeezing into collapsed buildings to search for people who may be trapped in the rubble. Origami robots might also help people with physical challenges perform common household tasks. For example, a stack of modules could be mounted to a wheelchair and operated with a joystick, allowing a user to retrieve items from a shelf. Onal’s research team, which includes robotics engineering PhD candidate Junius Santoso, will focus first on determining the mechanical mapping and the geometric impact on stiffness and motion. They will then develop force sensing to allow the robot to detect objects and go around corners. The team will then program various motions in order to create a two-dimensional robot. Onal’s research builds on his earlier work on soft robotics. 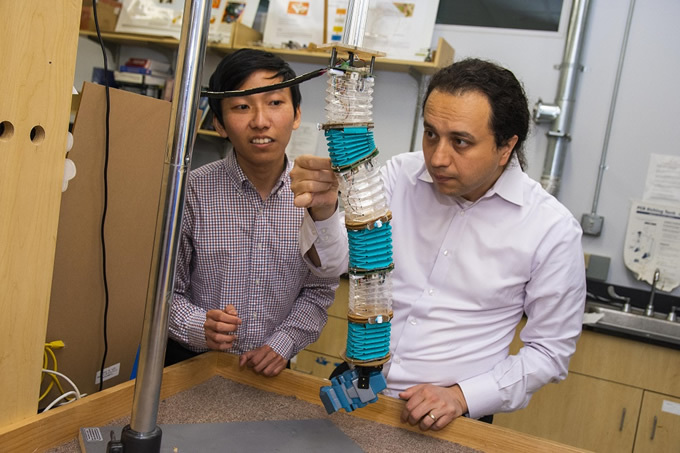 Last fall, he and Jie Fu, assistant professor of electrical and computer engineering, received a three-year, $400,000 award from the NSF to explore how traditional soft robots can be designed to autonomously slither through rubble and other confined spaces with snake-like movements.